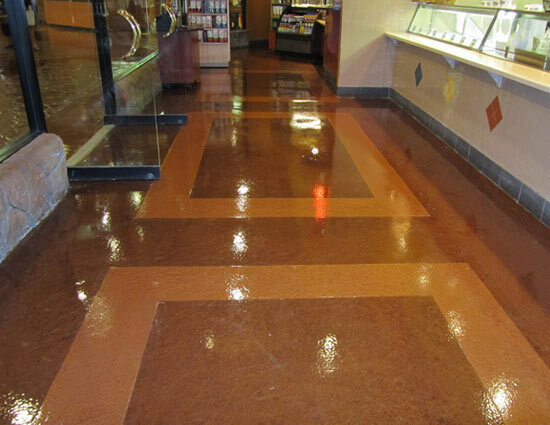 Concrete floors in stained, colored, painted, and personalized glory are popping up in retail stores, trendy restaurants, offices, and homes everywhere. A concrete floor offers numerous options for interior surfaces, rooms including nearly limitless designs, colors, and even health benefits. 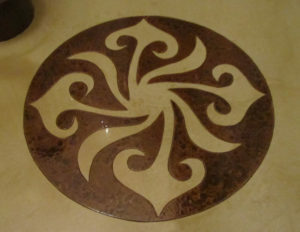 One of the most common places you’ll see decorative concrete these days is under your feet. Whether it’s acid-stained, painted, overlays, microtoppings, radiant floors, or a unique personal floor, concrete floors offer a range unlike any other material. Concrete can be so uniquely designed or so naturally colored that it blends seamlessly with other elements in a room–oftentimes, you don’t even realize it’s a concrete floor you’re standing on! Many are welcoming, embracing, and anxiously pursuing concrete floors for their own home projects. All it typically takes is one look whether it’s in a magazine, on a home tour, a television show, or in someone’s home and you’re hooked. It enhances the integrity of architect’s designs. They are easy to maintain. It’s easy to change, especially if you sell your home; the next owner can place carpet or wood on top of the concrete slab. They are a good alternative to carpet if you have allergies.